TOWNSVILLE, Queensland, Australia, April 6, 2016 (ENS) – The most pristine section of the world largest coral reef is experiencing the worst mass bleaching event in history, scientists have determined during aerial and in-water surveys of the Great Barrier Reef. The most severe bleaching is in the far northern sector between Cooktown and the tip of Cape York. Bleaching has also intensified in the area between Cooktown and Townsville. Research conducted by multiple research vessels and island research stations confirms what is visible from the air, that the majority of reefs north of Cairns are bleached out. All species of corals are being affected. “Even more concerning, we haven’t yet found the southern limit of the bleaching,” Hughes said. “We’ll be conducting further aerial surveys this week in the central Great Barrier Reef to identify where it stops. He said the southern part of the Great Barrier Reef “dodged a bullet” due to cloudy weather that cooled the water temperatures. “We could see extensive bleaching even among the most robust massive corals,” said James Kerry, project manager of the National Coral Bleaching Taskforce, who participated in the aerial surveys. Summer in the Southern Hemisphere is just coming to a close, and this summer has been devastating for the corals on the Great Barrier Reef’s northern section. “The fact that these hardy species have also turned white shows just how severe summer conditions have become on the northern Great Barrier Reef,” Kerry said. “Residents we spoke to in Cape York were shocked by what they are seeing, telling us that they had never experienced anything like this before,” he said. 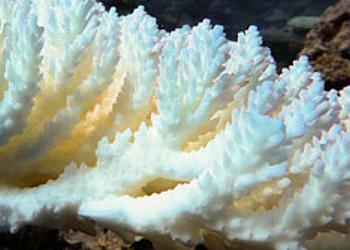 Coral bleaching occurs when live corals are stressed from overheating. Heightened sea temperatures cause them to expel tiny photosynthetic algae, called zooxanthellae found in healthy corals. The algae provide their host coral with food in return for protection. The loss of these colorful algae causes the corals to turn white. If the waters cool down quickly, the zooxanthellae can recolonize them, but if the corals remain stressed for many weeks, they will die. Reef scientists say that there was substantial cloud cover and rain over parts of the reef in March, but this did not have a sufficient cooling effect on sea temperatures to relieve heat stress. On Tuesday, after months of planning, 300 Australian coral reef researchers launched a small flotilla of research vessels. Their mission is a race against time – to document coral bleaching along the 1000 kilometer northern half of the Great Barrier Reef before more of the heavily bleached corals die. “So far we have collectively undertaken 12 separate missions using research vessels, and by the end of this month we will have examined close to 90 reefs that have also been surveyed from the air,” says Professor Morgan Pratchett from the ARC Centre of Excellence for Coral Reef Studies. The nonprofit conservation group WWF-Australia is urging Prime Minister Malcolm Turnbull to travel to the Great Barrier Reef to see the damage firsthand and to show government leadership on climate change. 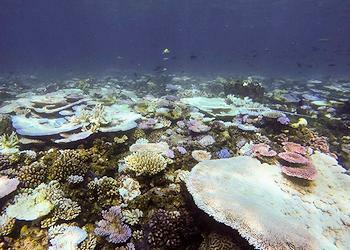 “The Australian government has said in the past that the reef’s World Heritage values are safe. But if there are mass coral deaths from this event, what does that mean for the reef’s ongoing World Heritage status?” asked Dermot O’Gorman, CEO of WWF-Australia. The Prime Minister’s office has announced no plans for Turnbull to visit the Great Barrier Reef,. But Environment Minister Greg Hunt says that in view of the current bleaching event, in September the Australian government will provide a research vessel and cover costs of data analysis to re-survey 40 sites in the Far Northern section of the reef surveyed in 2012 and 30 of the same sites again surveyed in 2014 after Tropical Cyclone Ita. The Australian and Queensland governments are investing a projected A$2 billion over the next decade to protect the Great Barrier Reef. The National Coral Bleaching Taskforce co-ordinates the research efforts of Australia’s marine science community in the event of a mass bleaching event. The taskforce gathers 10 research institutions and over 300 scientists across Australia and the United States. The associated research institutions are ARC Centre of Centre of Excellence for Coral Reef Studies, Australian Institute of Marine Science, CSIRO, Great Barrier Reef Marine Park Authority, James Cook University, the University of Queensland, University of Sydney, University of Western Australia, and Western Australia’s Department of Parks and Wildlife. In the United States, NOAA, the National Oceanic and Atmospheric Administration is a participant. In response to the initial survey findings, the Great Barrier Reef Marine Park Authority, GBRMPA, has upgraded its alert system to level three, severe regional bleaching, the highest category in its coral bleaching response plan. “A level three response level means we’re stepping up surveys in response to the coral mortality to help us better understand the effects of various pressures on the Reef and help guide management actions,” said Great Barrier Reef Marine Park Authority Chairman Dr. Russell Reichelt. “This means reducing nutrient and sediment loads in catchment run-off, continuing our program to control coral-eating crown of thorns starfish and being part of a global compact to reduce overall emissions,” Dr. Reichelt said. The bleaching event is still unfolding, he explained, and the full extent and severity of bleaching may take several weeks to become clear. Reef-wide assessments and analyses of bleaching will take several weeks to complete. The northern third of the reef is experiencing the most heat stress, with recorded sea surface temperatures of 1-2 degree Celsius above average. The central part of the reef is generally about one degree Celsius above average, while temperatures in the southern part are about 0.5-1 degree Celsius warmer than average.